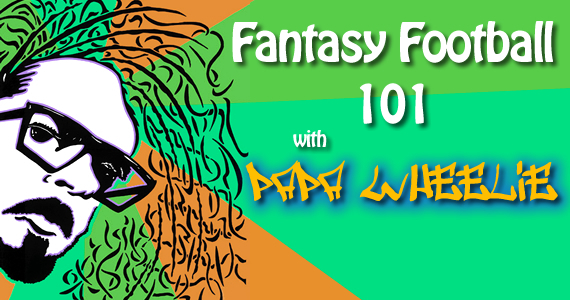 Papa Wheelie ponders the age old question of what to do with his Fantasy Football rookies. There’s a saying in MotoGP, “it’s not if you crash, it’s when and how hard.” This quote is generally applied to rookies because the first year in the biggest class is so intense that almost every rookie goes down and gets hurt. This first injury is usually a tough one because it brings these kids back down to earth, and makes them remember that they are mortal and are on a knife edge at any given moment of a race. I’m starting to realize now that this saying isn’t really just applicable to MotoGP, but Football as well. Week 4 looks like the week a couple of my players had their falls, and at a key moment in my campaign. Last week was a BYE week for Aaron Rodgers, so I had a chance to play my hotshot rookie quarterback, EJ Manuel. Although the Bills came away with a big win against the defending Super Bowl champions, Manuel had a brutal day, with only a 167 passing yards, two interceptions and a fumble. Those kind of numbers added up to a big let down for my team. Speaking of choking, who can forget the New York Giants and one of my “star” running backs, David Wilson? Admittedly,he wasn’t my first choice in the draft, but after James Starks‘ injury, my backfield is looking a little rough. Wilson is doing better and better in recent weeks, but overall the Giants offense is in serious need of an overhaul. Both of these players missed their projections by over 10 points, and left me behind for a close loss in my match. The silver lining of week 4 was that Nate Washington and the Kansas City Chiefs defense came through big time to make it a respectable match. Dez Bryant continues his strong shows with another couple of touchdowns and six receptions for over 80 yards. Quiet games from Giovani Bernard and Julius Thomas spelled a close defeat for my team, though. Although my only move for Week 4 is kicking James Starks to the curb for Le’Veon Bell, there’s not much I’m changing up for Week 5’s match. The points are already shaping up to be a very close match, so this weekend is shaping up to be another nail biter.